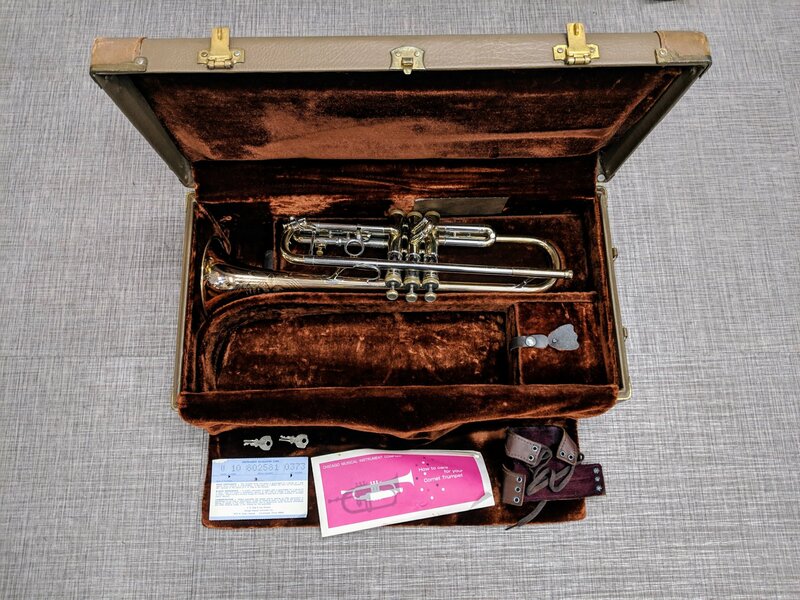 This is a very nice used Olds Recording model trumpet. The lacquered finish is in very good condition with only minor wear throughout. The serial #898445 dates its manufacture at 1974. Features include mother of pearl pull nibs on the 1st & 2nd valves, cool art deco engraving on the bell, 3rd slide trigger ring for tuning, rose brass bell and the unique offset #2 valve casing. The trumpet just received a complete valve replate and rebuild, so the valves are completely airtight and work flawlessly. The instrument also received our Ultrasonic Cleaning and Synthetic Valve Alignment with a complete instrument pressure test to ensure there are no leaks. Includes the original Olds case with care & maintenance paperwork, case lock keys and an older valve guard. This is a great playing vintage trumpet that will be a welcome addition to your collection!